Ah, the season of spices. Whether it's a frothy chai, a steaming pot of cinnamon potpourri on the stove, clove lined decorations lining the mantel, or a simple molasses cookie in the oven...you know it's fall when you can smell these distinct spices. 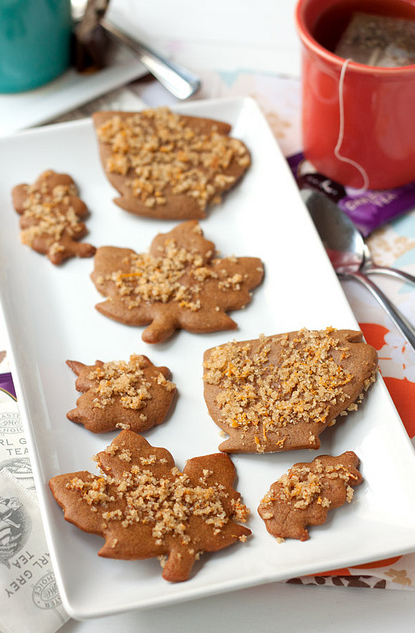 Try these cookies for a molasses and orange twist! The recipe is adapted from Martha Stewart's. Whisk together flour, salt, baking soda and spices in a medium bowl. Set aside. Put butter and brown sugar in a mixer bowl fitted with the paddle attachment and mix on medium until fluffy. Add the egg and molasses and mix until combined. Add in the flour mixture and mix on low until well incorporated. Divide dough into two disks and wrap each disk in plastic. Freeze for one hour or chill in the fridge several hours or overnight. Put turbinado sugar in a medium bowl. Add orange zest and use your fingers to incorporate it into the sugar. Set aside. You may want to lick your fingers at this point and that’s totally ok. Roll out one disk of dough on a very well floured surface. To make sure the dough doesn’t stick, roll it out to about an inch thick. Pick it up and sprinkle a bit more flour in the spot where it had been sitting. Flip the dough over and continue rolling to just under 1/4-inch thick. Use the cookie cutters of your choice to cut out shapes in the dough. Cut them as close as possible to minimize the amount of times you will need to re-roll the dough. (As more and more flour gets incorporated it starts affecting the taste and texture of the cookies.) Transfer to the baking sheet, about one inch apart. (If any of them stick to the counter, a thin metal spatula or knife slid underneath should easily free them.) When one baking sheet is full, transfer the whole sheet to your freezer to sit for about 15 minutes (or about how long it takes to fill up the other sheet with cookies). Gather up the leftover dough into a ball and place it back into the freezer. Take out your other ball of dough and repeat the process all over again. Take the sheet of cookies out of the freezer and sprinkle each cookie generously with the orange sugar. Bake for 10-12 minutes or just until starting to crisp around the edges. Transfer cookies to wire rack to finish cooling.